This came across my "news" feed yesterday. I also saw a quick segment mentioned on the TV but I never watched it. I haven't seen this mentioned here yet so he you go. I like how as soon as it begins, there's someone yelling "It's terrorist attacks! Go Home!" Good to know there was such an expert on scene informing everyone what's going on. This video seems to suffer no differently than any other "shocking!! 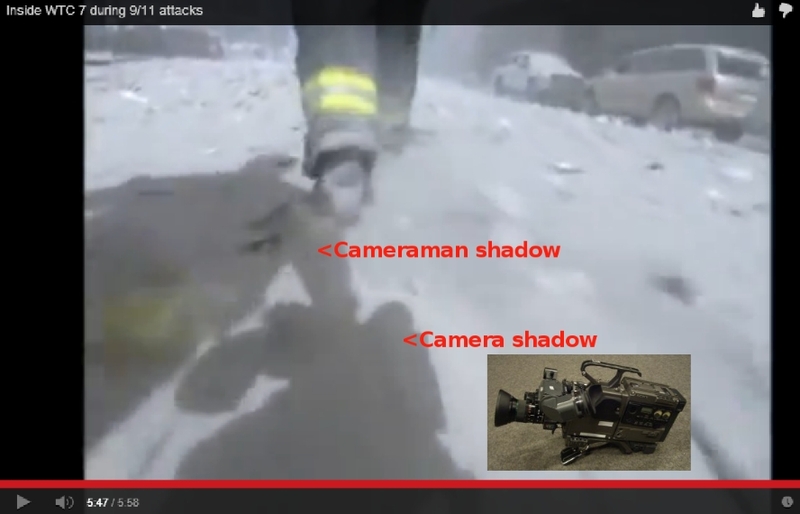 amateur footage" of the 9/11 terrible animation attacks. At 1:30 peds walk around aimlessly, a bit after that, "The whole building!" oh really? "I never thought the building would collapse"
At 5:50, I don't even... inside job? Driving and shooting? What? This isn't even coherent. The blurb says the footage will give me chills. It didn't. It's unclear as to whether or not the footage was compiled using various cameras, or how any of this footage was even acquired. 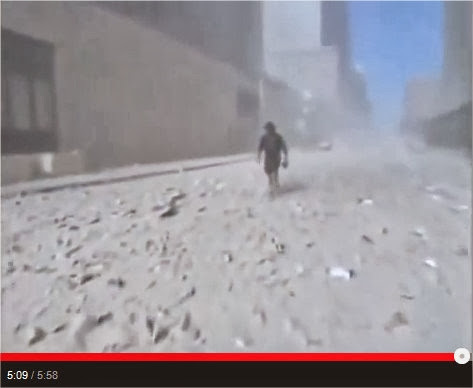 How anyone can say - in September 2013 - that this is "never-seen-before-footage of 9/11" is not just ridiculous: It's just another bare-faced lie. These clips were all released around 2010 - at the time when NIST were supposedly (get this!) 'forced by a FOIA act submitted by the ABC TV network to release all of their hidden footage of the day"... Imagine that, folks: ABC TV playing the righteous, 9/11 truth-seekers! As it is, I am - and have been for over three years now - fully familiar with each and every frame of this supposedly "new 9/11 video". Poor Americans - surrounded by an army of deceivers and liars. When will this ever stop? At around 1.25 into the video, just after the shot of someone "buying more film", a large bunch of people seem to be walking very slowly across a street towards the camera, and are facing away from the towers, just in time for the 'second strike' to happen and they all whip around in a 180 to look at the towers. This shot seems remarkably strange to me for a few reasons. Why aren't more of these 'people' looking at the towers anyway? Where are they going? This is early in the day, and they are quite far from the WTC. I guess that breakfast meeting won't conduct itself? Maybe it's true what they say about NYC never stopping, and these guys were just itching to get back to their boring desk jobs. "Just a plane crashing into the WTC. Nothing to see here." It seems to me this shot is to reinforce the 'reality' of the impacts, and the idea that many people were around to see the direct aftermath; and also to strengthen the narrative that this was a completely surprise event. This shot really does remind me of someone saying "BOO!" Even on the surface, it just seems very comic and stage-managed. Are people here familiar with this video? It's called 'Inside WTC 7 during 9/11 attacks'. I hadn't seen the "footage" contained before. It has some "interesting" moments at least, and yet again like most videos of this sort hammers home the 'planes' myth and others. Just wondering what others make of it. Are people here familiar with this video? It's called 'Inside WTC 7 during 9/11 attacks'. Yes - I'd guess all of the longtime 9/11 researchers here are quite familiar with this lame, obviously phony and staged "WTC7 video". See, what I'd like you to realize - firstly and foremostly - is that these "9/11 videos" were in all likelihood shot anywhere but at the WTC. If you think that's impossible, think again - and remember all of the HollywooL disaster movies you've seen in your lifetime. You don't really think the catastrophic scenes featured in movies such as "Armageddon (1998) or "Independence Day" (1996) were ACTUALLY shot in the streets of NYC / Manhattan, do you? 1. The cameraman was a skinny, superhuman fellow who deserves a place in Hollywool's hall of fame. 2. The shot is the result of some studio wizardry - as regularly employed by Hollywool producers. The camera (+ man?) smoothly moving up and down the not working escalators is also quite a feature. Like the lit up windows in the otherwise dark, no electricity building, adding effects. I agree with Simon - it is 100% Hollywood props. Despite the piss-poor resolution and the inexplicable "war-zone" damage inside the building, some of the indoor scenery in the WTC7 video is pretty convincing at first sight, but the outdoor scenery is dreadful and playstation-like. That looks like the Silent Hill prototype.